A guaranteed success at any child’s Birthday party, face painting is fun, popular and photogenic. We know your party needs to be a huge success for the party child, your family and your guests. We bring all the colour and sparkle to ensure it’s a fabulous celebration. 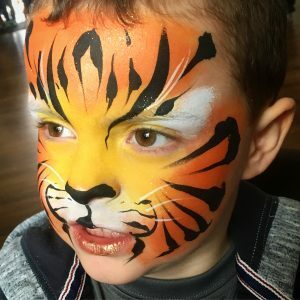 In our six years of providing face paint for children’s Birthday parties we’ve fine-tuned our service to minimise your time and effort; from a quick and easy booking process, through to smooth party delivery. Once we’ve arranged your party we’re on the end of the phone if you need to chat about anything, from preferences to logistics. If you’d like to take a look at our kids designs you’ll find them in our full portfolio here, or on instagram @thegltrbox. Perhaps you’re having a themed party? Just let us know and we’ll offer designs to suit. Maybe you’ve arranged other entertainment? We’re happy to fit in with your activities. Not sure how much time or how many face painters you need to book? Glitterbox artists work fast, producing children’s favourites at around 15 face paint designs per hour. Wondering whether to opt for a ‘WALKABOUT’ face painter, or traditional table-based? To help you decide, take a look at how the walkabout option works. Need a quote? Get in touch, we’d love to hear from you! Ready to book straight in? Here’s the online booking form.